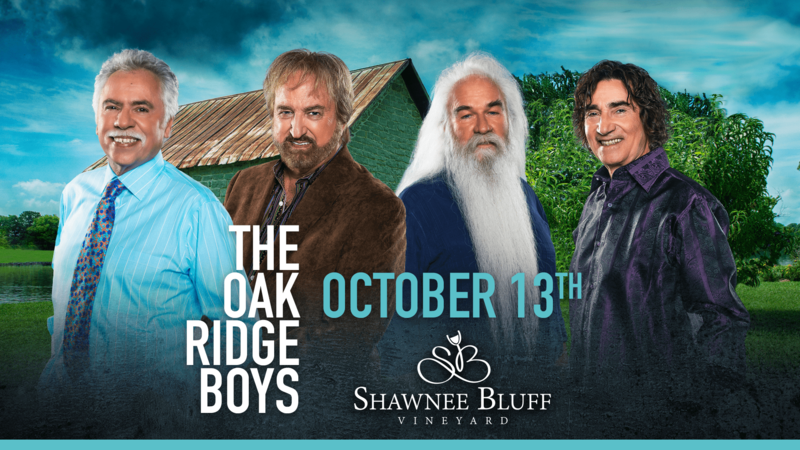 The Oak Ridge Boys Return to Shawnee Bluff Vineyard! Gate and Doors open at 5pm. Food Vendor Rustik Rooster BBQ, Tilly's California Burrito and Taco Truck and Kettle Corn. The Oak Ridge Boys take the Stage at 8pm. All ages show. Kids 5 and under are free, but must buy a ticketed seat if needed. Parking Fee $5.00 and 50% of proceeds go to local charity L.A.M.B. Tickets go on sale May 13th at 8am CST.